In 2016, 2,799 texans died due to drug overdose. In 2015, more than 52,000 people died of an overdose in the United States and more than half of those involved opioids. The problem is widely considered a national epidemic and although Texas ranks 48th among states in opioid deaths, the state is home to four of the country’s worst cities for opioid abuse rates. Texarkana, Amarillo, Odessa, and Longview make the top 25 at numbers 10, 13, 15, and 17, respectively, according to a 2016 report by Castlight Health, Inc.
Opioid prescriptions have dropped dramatically since 2013 and the use of prescription monitoring programs across the country has increased significantly. Still the number of deaths continues to climb. According to a report from the Kaiser Family Foundation, heroin and illicit synthetic opioids like fentanyl are now responsible for more overdose deaths than prescription medications. Changing prescribing practices alone won’t stop the scourge of the nation’s opioid epidemic. Patients desperately need access to high quality, evidence-based treatment. AAFP reports that 90 percent of patients in need of addiction treatment services do not have access to appropriate therapies, like medication-assisted treatment. AAFP and the American Medical Association have joined forces to call on all payers to remove barriers to treatment for substance use disorder. In Texas, the Health and Human Services Commission is implementing strategies to combat opioid use disorders. As part of the federal 21st Century Cures Act, the agency received a grant of $27.4 million to be used for prevention, training, outreach, treatment, and recovery support services. HHSC estimates the funds will directly help 14,000 people over a two-year period. The project is called the Texas Targeted Opioid Response and its core strategies include increasing access to care and support, reduction of service gaps within the continuum of care, and increasing public awareness through education and outreach. State agencies, health systems, and nonprofit organizations from coast to coast are involved in similar efforts but if we are to stem the scourge of overdose deaths, family physicians on the front lines of primary care must actively help close the treatment gap for those afflicted with addiction and work to prevent opioid addiction by changing the paradigm of chronic pain treatment. In this edition of Texas Family Physician, we present a set of resources to help members combat the opioid crisis. Clinical practice guidelines to improve the way opioids are prescribed help physicians and health systems make sure patients receive effective treatment for pain while helping prevent misuse, abuse, and overdose. The gold standard may be the CDC Guideline for Prescribing Opioids for Chronic Pain. It is specifically designed to give guidance on prescribing opioid pain medication for patients 18 and older in primary care settings. The guideline is focused on treating pain outside of active cancer treatment, palliative care, and end-of-life care. AAFP officially affirmed the value of the CDC guideline in April 2016 in a list of key recommendations. AAFP’s magazine Family Practice Management published a helpful article in its November/December 2014 edition entitled “How to Monitor Opioid Use for Your Patients With Chronic Pain” by Stefani Hudson, MD, and Leslie Wimsatt, PhD. The article describes how with some simple tools, physicians can establish a written policy and a systematic process to prescribe opioids safely and securely. You probably already know about this and likely you already use it, but just in case, you can check into your patients’ prescription history by registering for an account with the Texas Prescription Monitoring Program, PMP Aware. As of September 2019, physicians in Texas will be required to use the Texas Prescription Monitoring Program administered by the Texas State Board of Pharmacy. 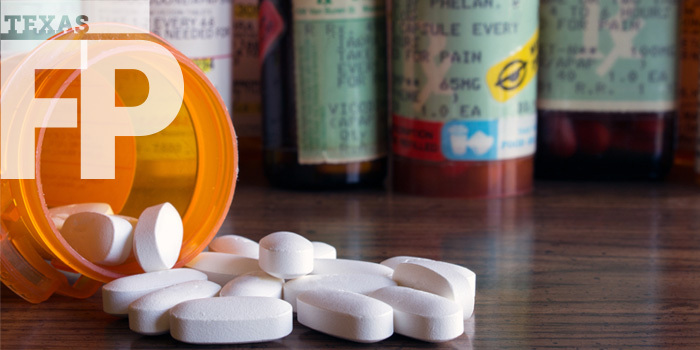 The program allows physicians and pharmacists to examine a patient’s prescription history when considering prescribing or dispensing potentially addictive or dangerous pharmaceuticals. Texas is currently one of only about a dozen states that doesn’t require physicians to use a prescription monitoring program, but the number of doctors using the program in the state is already on the rise. As the law is currently written, physicians will have to look up a patient’s prescription history before prescribing opioids, benzodiazepines, barbiturates, or carisoprodol. Doctors will not be required to run checks on patients who have cancer or are in hospice care. If you’re not already registered, you can establish an account on the Texas PMP Aware website. Often you know you need to refer a patient to an addiction specialist or a therapist of some sort to provide more specialized counseling and treatment, or you may need to send someone to inpatient rehabilitation. But finding the right specialists and rehabilitation centers is not easy in our fragmented health care system. This becomes much more difficult in rural communities. Connecting mental health resources with primary care is a perplexing problem that we must begin to solve if we are to address the prevalence of chronic diseases linked to behavioral health. Texas Health and Human Services contracts with 39 local mental health and two behavioral health authorities to deliver services across the state. That’s a good place to start when looking for mental health resources in your community. You can search for your local mental health authority by county, city, or by ZIP code on the Texas Health and Human Services website. Outreach, screening, assessment and referral centers are located in the state’s local mental health authorities across the 11 HHS Regions of Texas. Access the list and a mapping app for different kinds of services around substance use disorder on the Texas Department of State Health Services website. MAT is one of the most effective treatment options available for people with substance use disorder. There are MAT protocols for opioid use, alcohol use, and smoking. They use a combination of medications, counseling, and behavioral therapies to provide a whole-patient treatment. Methadone, naltrexone, and buprenorphine comprise the three medications indicated for opioid addiction. The federal Substance Abuse and Mental Health Services Administration hosts lots of information about MAT as well as the registration processes necessary to become a certified MAT provider. Visit the SAMHSA Medication-Assisted Treatment page to get started. Methadone is an opioid agonist that helps prevent withdrawals. It must be dispensed daily in a specially regulated clinic. Texas has 16 state-funded opioid treatment service locations for indigent patients. In 2016, 5,381 people with opioid use disorder were admitted to state-funded treatment, but only 785 received MAT. Studies show medication-assisted treatment, or MAT, cuts all-cause mortality due to substance use disorders by more than half. Currently only 85 licensed providers of methadone practice in the state and only about 1,200 providers are certified to prescribe buprenorphine. achieve qualification by training or certification. SAMHSA requires physicians to take an eight-hour buprenorphine waiver training course to achieve qualification and there are a number of places to go for that training. AAFP has a partnership with the Providers Clinical Support System for Medication Assisted Treatment. You can register and perform the training on the PCSS-MAT website for free, and you’ll also find a plethora of tools and resources for treating patients with opioid use disorders there. The American Society of Addiction Medicine offers a waiver training course in multiple formats. The Project Extension for Community Healthcare Outcomes, or Project ECHO, is a learning and guided-practice model in which expert teams use videoconferencing technology to teach physicians in remote areas. The project began and is still largely housed at the University of New Mexico School of Medicine. The first project focused on treatment of kidney disease but the model is now used to expand clinical expertise across a wide range of diseases, including opioid use disorder. For a few more months, Project ECHO is hosting a set of interactive learning opportunities funded by a grant from the Health Resources and Services Administration that results in a certificate of training completion from ECHO and the American Society of Addiction Medicine. The program ends on August 31, 2018. It includes an action plan, pain inventory, work questionnaire, patient-physician medication agreement, opioid risk tool, and links to external resources, AAFP articles and issue briefs. And don’t forget about the trove of patient information you can mine at familydoctor.org. From the main toolkit page, you’ll find links to at least four articles for patients on chronic pain, opioid addiction, prescription drug abuse in the elderly, and the safe use, storage and disposal of opioids. Opioid addiction and the death and despair it brings seem an almost intractable problem, and ending this epidemic will take the combined and sustained actions of all facets of society. Family physicians on the front lines of care have an integral role to play in this effort. We hope these resources assist you as serve your community.